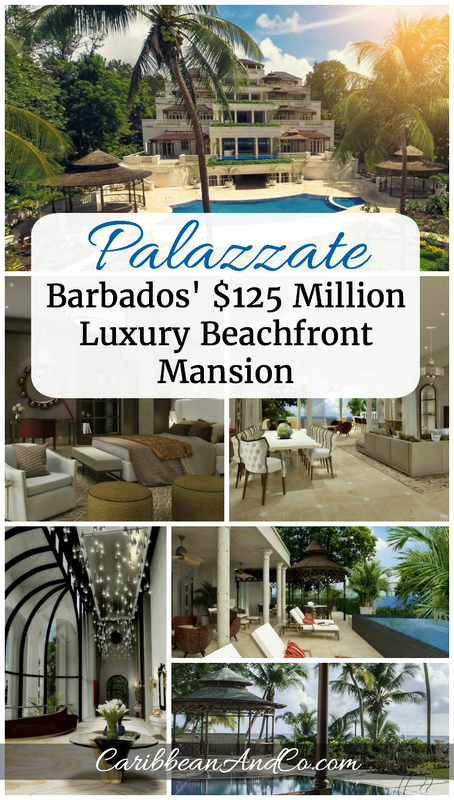 Palazzate - Barbados' $125 Million Luxury Beachfront Mansion - Caribbean & Co.
For the super-rich, real estate is a key asset. In fact, according to the Wealth-X World Ultra Wealth Report 2014, most of the 211,275 ultra high net worth individuals have anywhere from 8 to 17% of their portfolio in real estate and luxury assets. With their money self-made or inherited, they are purchasing luxury real estate properties in resort destinations across the globe including Barbados in the Caribbean. Wealth source for ultra high net worth individuals via World Ultra Wealth Report 2014. Graphic: © Wealth-X. Barbados is attractive to the wealthy as it has an international airport with direct flights to major American and European cities. Also, the island’s tax and immigration structures are quite favorable. Plus with hot weather and sunshine year-round, Barbados the birthplace of rum also offers world-class recreational activities, fine dining, and a laid back and inviting lifestyle. 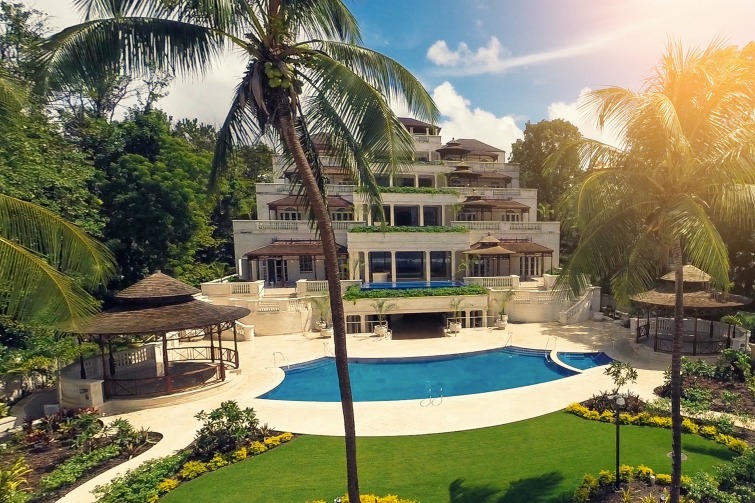 Barbados: Palazzate, a 75,000 sq ft luxury beachfront mansion. Of course, not all super-rich are solely concerned about price. Those with assets well above the minimum US$30million required to be considered an ultra high net worth individual are looking for investments that are unique and will stand the test of time. They require the best of the best. And it’s one of these billionaire global citizens with extended family and staff in toe that will be attracted to Palazzate, a 75,000 square feet luxury beachfront mansion recently completed in Barbados. With an asking price of US$125 million (yes! ), this one of a kind property designed by local architect Larry Warren is not just the most expensive in Barbados, but all of the Caribbean. Taking four years to build from start to finish, Palazzate was worked on by native craftsman using the finest materials from around the world, as well as hand-cut local coral stone. The craftsmanship and grand design rivals many of the modern fine homes across the globe. 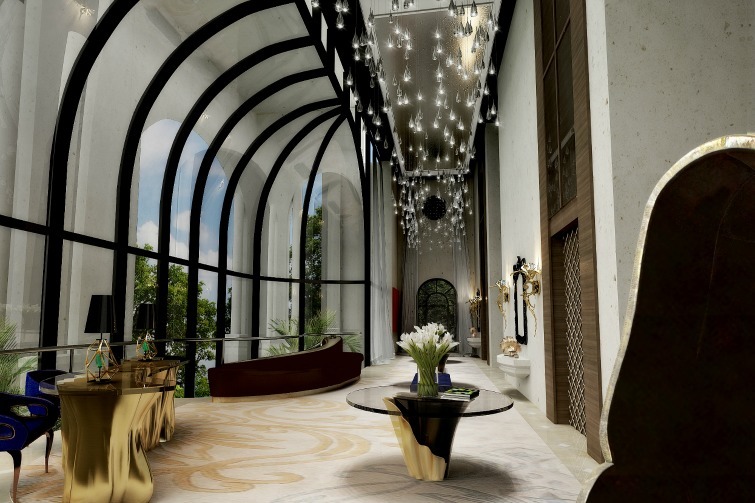 Barbados: Palazzate, a 75,000 sq ft luxury beachfront mansion – great entrance. With over 2 acres of land, Palazzate is located in an area known locally as the ‘Barbados Riviera’ and is close to the historic area of Speightstown. Important to note here that the property actually includes four ocean-front residences each with 13,000 square feet spread across five bedrooms, six bathrooms, individual media room, and pool. There are 3-floor plans built around a similar interior. The ground floor has direct access to the gardens and an extended patio. The first and second floors are very similar — each with the same marble and mahogany closets but have different finishes to the kitchens. All of the kitchens have the best appliances and access for staff. 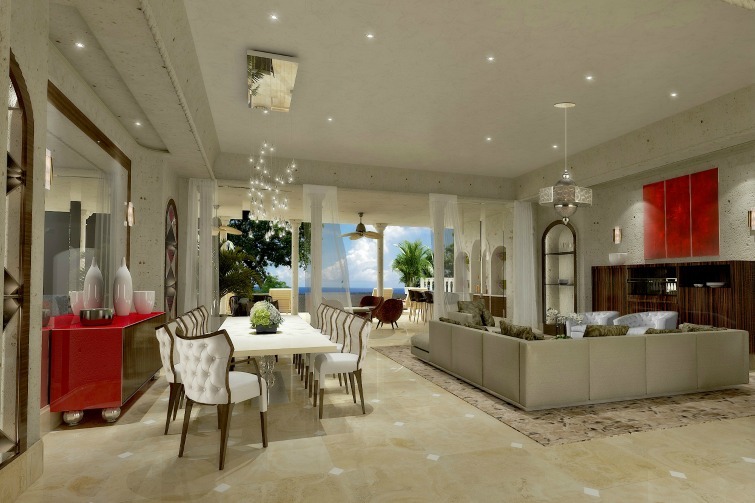 Barbados: Palazzate, a 75,000 sq ft luxury beachfront mansion – living room. 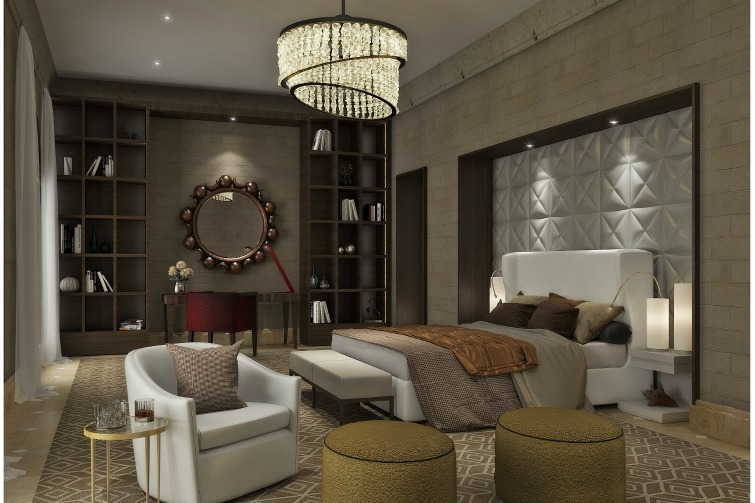 Barbados: Palazzate, a 75,000 sq ft luxury beachfront mansion – master room. This luxury mansion — really beachfront palace has it all including design features that provide total privacy even when on the patio. Prospective buyers who are looking to make a statement can see more of this one of a kind property in the Caribbean via mobile app built to showcase Palazzate. Exclusive access is provided via Alistair Brown, Director of Sales & Marketing, 1-246-262-8112 or 1-772-341-0132. 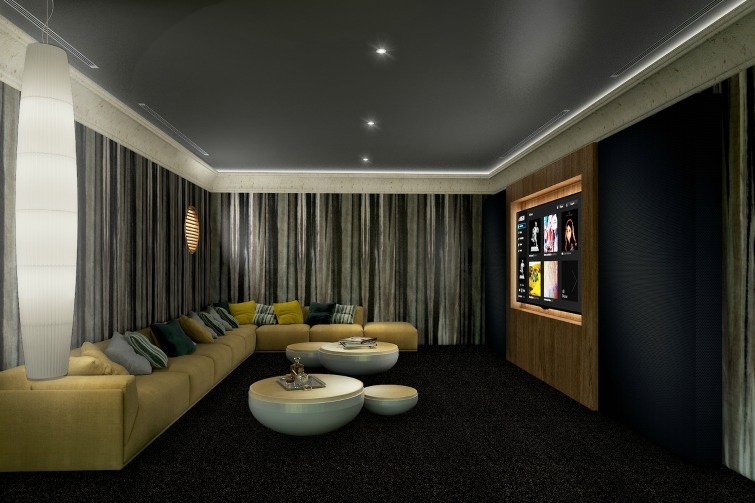 Barbados: Palazzate, a 75,000 sq ft luxury beachfront mansion – media room. 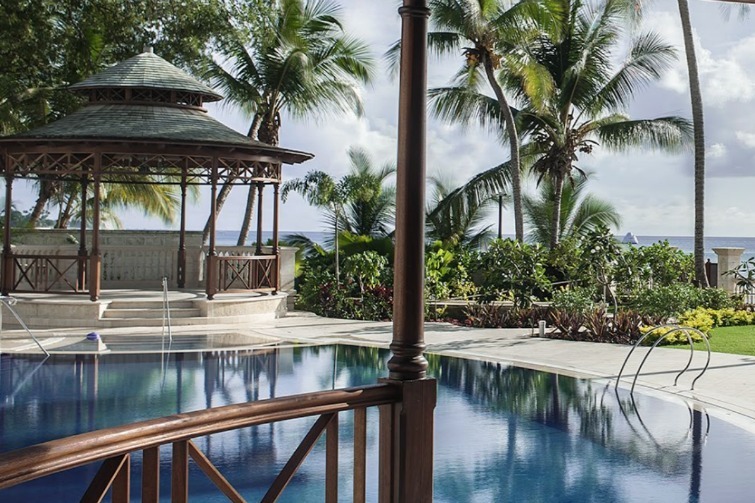 Barbados: Palazzate, a 75,000 sq ft luxury beachfront mansion – veranda.